We live in a very small space…and sometimes we can’t get outside to hoop due to rain or heat. So we hoop inside! 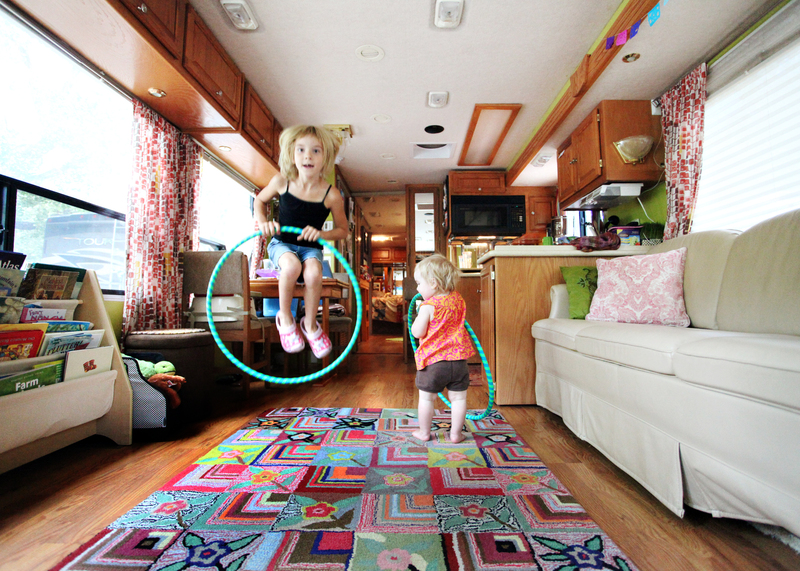 The photo above is in our main living area in the RV…the girls are playing with my poi hoops, but I am also able to waist and shoulder hoop with up to a 38 inch hoop. Sometimes after everyone falls asleep at night, I hoop hoop hoop in my little space until I “work it all out” 🙂 I love the release it provides after a long day. It’s even more fun to use my LED hoop inside in the dark…my own personal light show. I do miss having a large indoor private space to hoop in whenever I want. I got spoiled at my parents house this summer with their large basement and mirrors! But I will take my hoop time however I can get it now (even if it means I am the spectacle of the RV park). Where do YOU hoop when you can’t hoop outside?